I’ve spent the last week wandering around the Southeast, near where my women’s fiction novel, The Lone Wolf, is set, so it’s only appropriate that I’m also posting from it this month. Last week, Kasey reminisced with her husband, David, about their first date. This week, we get her first impressions of her new hometown, Asheville, NC. Like many metropolises around the country, Asheville had recently poured millions into restoring its downtown area. The city center now bustled with gourmet restaurants, specialty boutiques, and plenty of tourists eager to dine and shop in such beautiful surroundings. The town had made it to the top of many quality-of-life lists, leading a number of retirees to move to the area in search of opportunities to spend their pensions. As a result, Asheville was flourishing, supporting a vibrant arts scene and many independent retailers and restaurants. I strolled along, taking in the streetscape. Tantalizing aromas wafted out from little restaurants and cafés, and I stopped to examine the menus posted at some of them, making a mental list of ones I’d like to try. Musicians decorated the street corners, ranging from Mongolian pipe players, to drummers using plastic buckets, to simple acoustic guitarists. Bright flowers overflowed from planters, giving the sidewalks an old world charm. 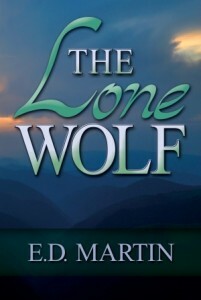 Then pick up a copy of The Lone Wolf at Amazon. I’m overwhelmed with your description of the town. I’d love to go there. Alas it’s not in the cards.Beautiful snippet-travel-log. I’ve never had any thoughts about Asheville, but you make it sound interesting. What a great description of Asheville! I could picture (and hear, and smell) it all. Wonderfully done! Wonderfully vivid description, I could easily picture the town.